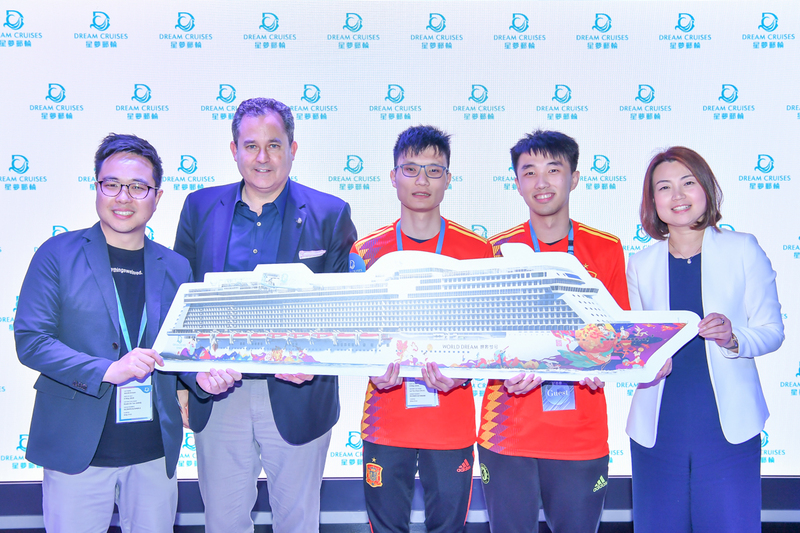 (2nd left) Mr. Thatcher Brown, President of Dream Cruises; (1st right) Ms. Christine Li, Senior Vice President and Head of Marketing, Dream Cruises and Mr. Ken Kwok, Assistant Program Director of CR1 with the winners of the eSports football competition. Participants of the eSports football competition had a group photo with honourable guests in World Dream’s dedicated eSports facility. 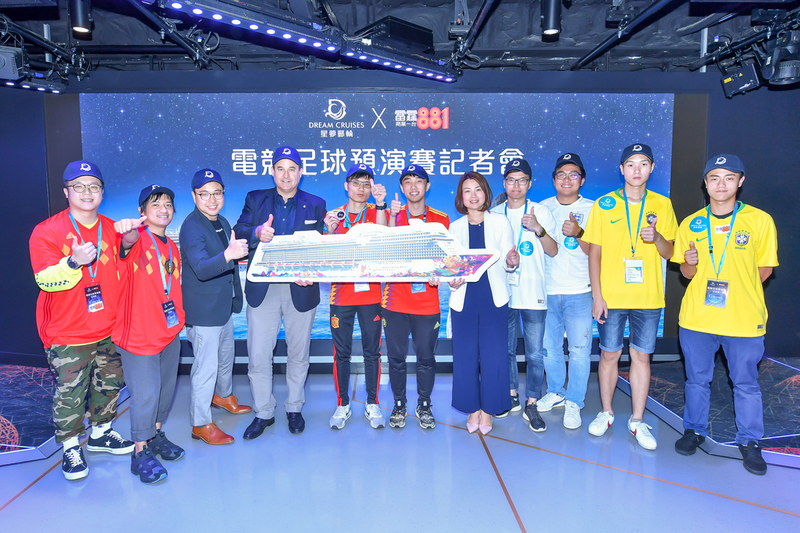 Hong Kong, 2018-May-08 — /Travel PR News/ — Dream Cruises unveils the world’s first permanent eSports facility at sea today, where members of the public had their eSports experience debut and enjoyed a friendly match of FIFA18 with their favourite radio hosts. The 1,700-sq.ft venue is part of ESC Experience Lab, the VR games central aboard World Dream, the 150,000-ton megaship with dual homeports in Hong Kong and Guangzhou. Referring to video game competitions that involve intensive mental and physical training, eSports has emerged as a rapidly growing sector globally with vast market potentials. It has already been admitted as a medal sport for the 2022 Asian Games and is now under review by the International Olympics Committee as a potential sports activity for 2024 Summer Olympics. In Hong Kong, the Financial Secretary Paul Chan Mo-Po has pledged HK$100 million in the 2018-2019 budget to promote eSports in the city, namely to promote eSports as a mainstream sport and to educate the public on this emerging trend. To celebrate the unveiling of World Dream’s dedicated eSports facility and in anticipation for the 2018 FIFA World Cup, Dream Cruises collaborated with CR1, the most listened-to radio station in Hong Kong, to host an eSports football competition on the cruise ship, where football enthusiasts enjoyed an exciting match of FIFA 18 at sea with their favourite radio hosts and a cheering crowd, which was streamed live on the only 4K LED wall to be installed on a cruise ship. The dedicated eSports facility on World Dream can accommodate a live audience of 80 persons and up to 10 players; any eSports event in the facility can be streamed live to all cruising guests on LED screens and monitors of the cruise ship, from indoor venues such as the 999-seat Zodiac Theatre, the lobby, Silk Road Chinese Restaurant and every in-cabin TV, to the outdoor theatre in Zouk Beach Club, totalling in an on-board audience of 3,376 minimum (based on lower berth of World Dream). For those who wish to give eSports a try, they may learn the basics from professional staff of the eSports facility with complimentary workshops and free trial games, available on every cruise departure. In addition to pro-gamer favourites such as DOTA, gamers can get their adrenaline rush with wide selections of games, including classics like Street Fighter and Tekken. Featuring the finest Asian and international dining, exceptional service, enthralling entertainment and inspirational experiences, World Dream redefines vacation travel for guests of all ages through transformational journeys at sea. Guests enjoy the highest levels of service and spacious comfort that Dream Cruises has become known, with over 70 per cent of staterooms featuring private balconies and a selection of connecting rooms catering to extended families and groups. World Dream offers 35 restaurant and bar concepts on board, including scenic al fresco dining, where guests indulge in the gastronomic experience of their dreams. This entry was posted in Cruises, News, Sports, Travel and tagged Dream Cruises, eSports, world cup, World Dream. Bookmark the permalink.